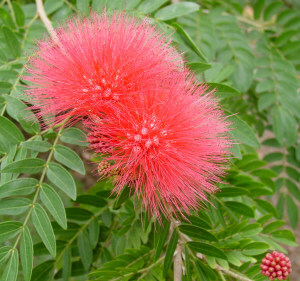 The red powderpuff plant (Calliandra haematocephala) is a shrub native of tropical America with a sprawling symmetrical growth habit and can reach 15 feet or more in height. You will need a good sized shady spot in your garden where it has room to fully develop. The plant has abundant evergreen foliage which is a rich shiny green composed of delicate compound leaves that appear almost fern-like. Leaves fold up tightly at night. Blooming begins in late fall and lasts well into spring unless frost is encountered which will kill off the tender flowers. The blossom itself is a spectacular vivid crimson pompom about 2 inches in diameter which literally cover the plant like a gaudily decorated christmas tree. Seedpods which look much like a bean appear shortly after blooming. These are very apparent, as they stick up above the blossom like a flag. Squirrels love them! Red powderpuff flowers have no apparent scent, but are nevertheless constantly visited by hummingbirds, bees and other insects. It is pretty well self-sufficient and without any apparent disease or insect problems. An occasional application of fertilizer is beneficial and will result in a richer green foliage color. The red powderpuff will thrive outdoors in zones 9 to 10 where it prefers a moist soil in partial shade. A hard frost will kill the plant, but will usually come back from the roots. If this happens, wait until new growth is showing, then remove all the dead wood. Prune powderpuff after flowering to contain size. This is best done branch by branch in order to maintain a natural look. Remove dead wood and broken branches at the same time. You can also thin the srub if needed. Work from the inside out and selectively remove crowded branches at an intersection or cut down to the ground. Propagation is by seed which should be left soaking in warm water for several days and then planted either directly into the ground or into individual pots for later transplanting. Occasionally you may find volunteer seedlings growing around a mature plant which can be easily potted up or moved to another location. You need to get these when quite small because they have a long taproot and transplanting will not be successful unless you get the whole thing. 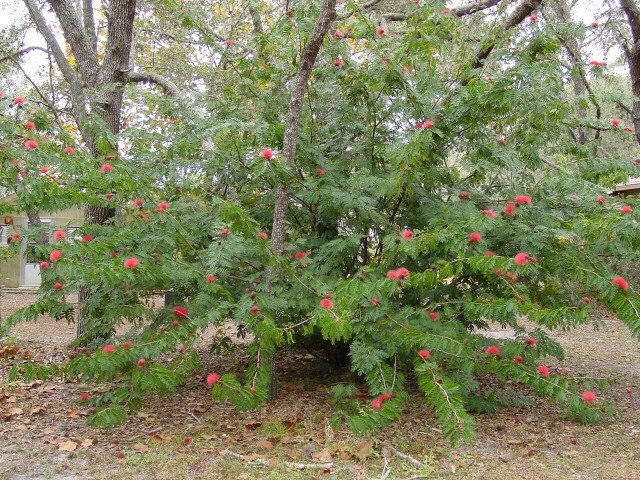 We have a large powderpuff specimen which grows and flowers profusely every winter in partial shade under branches of live oak trees without any special attention. It has been in the same spot for over 20 years and has survived droughts and occasional below freezing temperatures. About 2 years ago our entire back yard was flooded for a period of 12 weeks. We lost many old grandfather oaks, dozens of large azalea bushes and many other valuable trees and shrubs - but the red powderpuff seemed to enjoy it's time standing in water and actually made a new surge of growth. Be all means consider this lovely ornamental shrub if you have the room in your back yard garden - we highly recommend it.